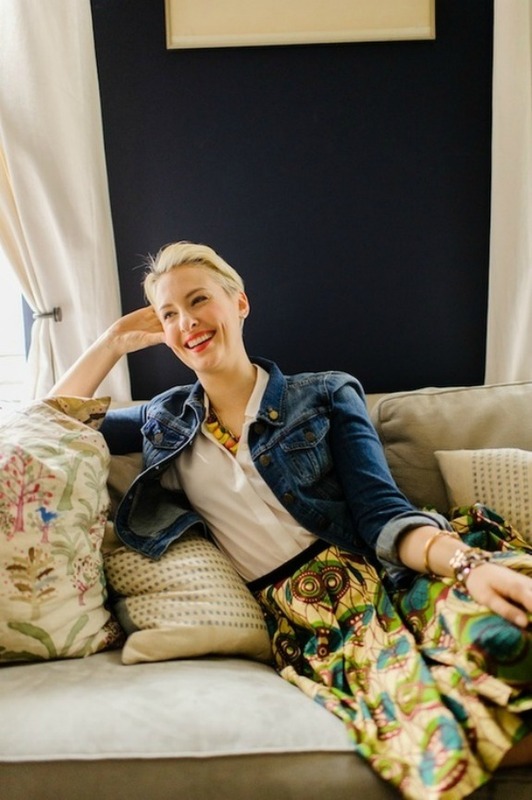 Lisa Salzer, the creative jewelry genius behind Lulu Frost, has been on my girl crush list since I had the pleasure of hearing her speak at IFB Conference back in February. She's so eloquently spoken, not to mention strikingly beautiful. Her impeccable style has also played a role in my admiration for her. Sharp, smart pieces paired with lots of sparkly baubles - a girl after my own heart. You can get a peek inside her lovely NYC home here and check out this interview with her and her cute boyfriend! i love how eclectic her style is! I love that look she's rocking in that first shot–so amazing! Also, her hair is pretty fierce (yes, I just said fierce, no I'm not Tyra Banks...I don't think...). She's amazing! And her jewelry is just unreal. Total girl crush! she is beyond chic! and so beautiful! Wow, absolutely LOVE all of her ensembles! If I had to pick a favorite, I'd have to say that last one really knocks it out of the park. Perfection! I love her sense of style. She just knows how to mix and match things perfectly. Such an attractive lady and such a defined sense of style. Love her.